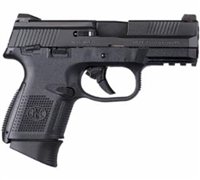 The FNS™-9 Compact offers the same features as the standard models but have 3.6” barrels and is designed to be snag-free for better concealment and a faster draw. 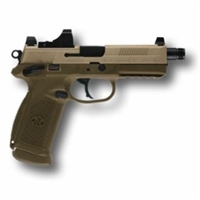 The FNX™-9 features an ergonomic, polymer frame with a low-bore axis for less felt recoil and improved control. The grip panels are checkered and ribbed for comfortable, no-snag carry. 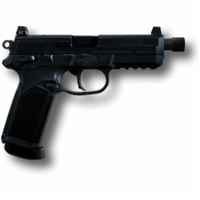 The FNX™ offers all of the features that dedicated handgunners want. 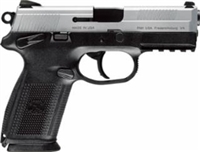 The ergonomic polymer frame has a low-bore axis for less felt recoil and improved control. The grip panels are checkered and ribbed for comfortable, no-snag carry. 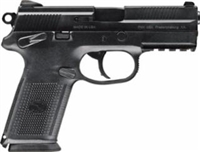 Improving on the FNP™-45 Tactical, developed for the U.S. Joint Combat Pistol Program, the FNX™-45 Tactical is the latest in technological advancements in handgun engineering, offering .45 ACP performance and a host of unique features that no other handgun can match.